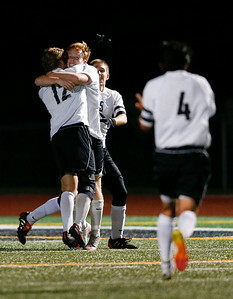 Patrick Murphy (4) from Jacobs celebrates with Colin Walsh (5) after beating McHenry in their Class 3A Huntley Boys Soccer Sectional semi-final on Tuesday October 25, 2016 in Huntley. 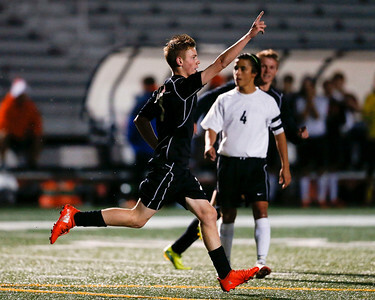 The Golden Eagles defeated the Warriors 2-1. Murphy scored the winning goal in the final minutes of the second quarter.